If you are still using foam chuck it out and try some of this exceptional shaving cream! 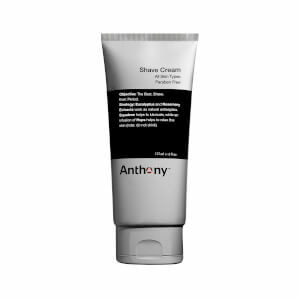 Anthony's shave cream contains natural moisturising oils to soften the beard and give a superb close, friction-free shave. Squalane binds moisture to the skin. Allantoin soothes. Rosemary clears the pores. Water, Glycerin, Stearic Acid, Myristic Acid, Palmitic Acid, Lauric Acid, Triethanolamine, Sodium Hydroxide, DMDM Hydantoin, Squalane, Vitamins E, D, A, and C, Panthenol (Vitamin B5), Aloe Vera Gel, Allantoin, Hops Extract, Golden Seal Extract, Peppermint Extract, Eucalyptus Oil, Rosemary Oil, Peppermint Oil.